One dinner and a movie night, it was my husband's turn to choose the film. He surprised us all by choosing Zootopia by the Walt Disney Animation Studios. While we are avid animation fans, his choices the last few times have been drama or more unique art offerings. No worries, we all sat back to relax and enjoy. What surprised us all was how good it was. In fact, ratings on Rotten Tomatoes shows a 98% from Critics and a 93% from Audiences. Young kids would get involved in the chases and basic comedy, but underneath it all there was a great adult movie going on. The animals all fulfilled roles that we see in regular adult life. The story line really showcases the different ways prejudice permeates our daily life. The main characters are well chosen. There is a female rabbit named Judy Hopps (voice by Ginnifer Goodwin)who is determined when she grows up to be a cop - unheard of. Her parents want her to join the family business, a carrot farm. 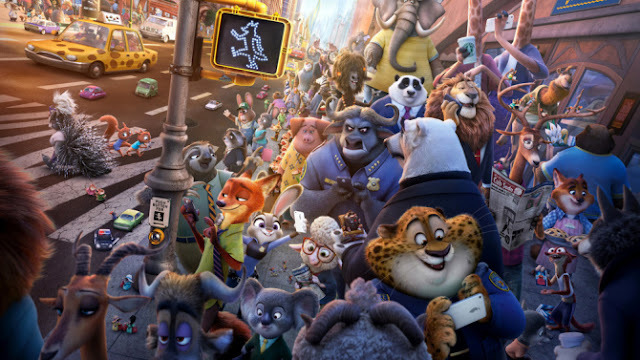 Through persistence and hard work she makes with honours through the training and is assigned to a precinct in one of the areas of the Metropolis of Zootopia. There are lots of kudos from the government representative on bringing the first rabbit in. but reality soon sets in. Judy ends up being flaunted as their token rabbit. On her first day, sitting in a room filled with LARGE, boisterous police animals, she discovers her dream isn't real. She is assigned to give out parking tickets. Her determination to change everyone' perception takes on many wild rides. 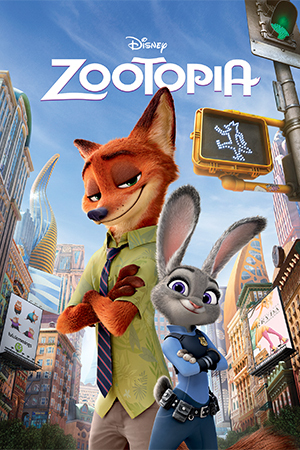 Through a strange plot twist, Judy ends up working with a fox called Nick Wilde (Voice by Jason Bateman) to find an otter who has mysteriously disappeared. If she fails she has to quite. Although this is a time of peace between animals, old prejudices still exist. Rabbits still are frightened by foxes and Nick's early experiences in how other perceive foxes have taken their toll. If that's what everyone thinks, might as well be one. He has spent his life working as a scam artist. How Judy and Nick end up working together and their journey to solve the mystery of why predators are going rogue is a crazy journey. The movie's pacing is great, the dialogue well written and the characters believable. Somewhere in the middle you forget this is animated animals. This really is a movie I think most people will enjoy, especially if you're ready for something a little more light-hearted. I don't want to spoil anything - but my favourite scene is in the DMV. I've included a trailer below, but DO NOT WATCH THIS unless you've seen the movie or don't intend to see it. It perfectly describes my life as a child with ADD. I laughed until my ribs hurt.